Half of the terror attacks carried out or plotted in Britain involve members of the banned extremist network Al-Muhajiroun, which has been linked to the 7/7 London bombings and the Lee Rigby murder, a new report reveals. Al-Muhajiroun, banned in 2010, has been implicated in numerous atrocities and plots since 1997, according to a new book ‘We Love Death As You Love Life’ by terrorism expert Raffaello Pantucci. The group was founded in the 1980s and was headed by radical preacher Anjem Choudary. The group has been a cornerstone of Islamic extremism in the UK. Research shows that out of 51 attacks and plots planned or carried out in Britain, al-Muhajiroun was linked to at least 23. Pantucci told MailOnline: “It is an oversimplification just to write them off as outcasts or losers, some of them have been involved in quite serious gang activity or crime in the past and end up finding this as a kind of redemption for their activity. “You also have to remember that some of the top figures are quite charismatic people, who are good at drawing people in and giving them these very aggressive ideas. The book’s title is based on a quotation from a suicide video made by one of the London 7/7 bombers. 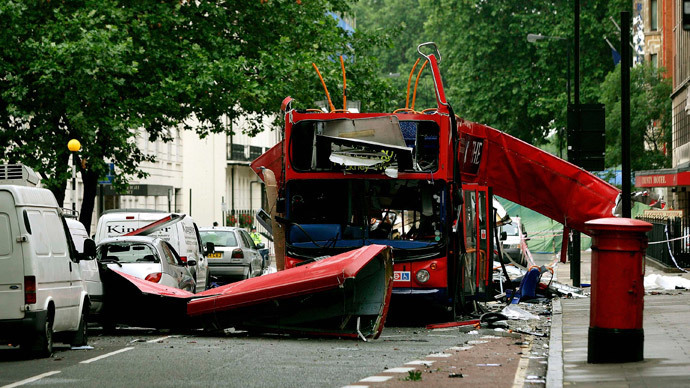 Numerous high-profile terror attacks in the UK have been influenced by the group. In 1997, a member of Al-Muhajiroun attacked a police officer at a rally. At least one of the bombers who carried out the 7/7 bombings, which killed 52 people in London in 2005, had met a key a supporter of Al-Muhajiroun, Omar Khyam. Michael Adebolajo and Michael Adebowale, who murdered Lee Rigby in broad daylight in Woolwich, south-east London in 2013, had both attended events organized by the group. Members of Al-Muhajiroun recruit outside mosques in poor areas of England, according to the BBC. Al-Muhajiroun has also been linked to an April 2003 bombing in Tel Aviv, a 2006 blast outside an army barracks in India and a plot in 2003-2004 to set off fertilizer bombs at various targets in London. Brustholm Ziamani, 19, who has been linked to the banned radical group, was sentenced last week for plotting a Lee Rigby-inspired attack on a soldier in the UK. During his trial at the Old Bailey, it was revealed that Ziamani had been radicalized by members of Al-Muhajiroun, who gave him clothes and a place to stay. They effectively ‘groomed’ a destitute 18-year-old and radicalized him. Al-Muhajiroun was founded by the Syrian-born cleric Omar Bakri Muhammad, who was expelled from Britain in 2005. The group changed its name to get around the law. It re-emerged several times under different names such as Islam4UK and Need4Khalafah, after it had been banned for being radical and extremist. The government outlawed Al-Muhajiroun and its offshoot Islam4UK in 2010, under the Terrorism Act 2000. Overall, all 10 pseudonyms were outlawed by the Home Office between 2006 and June 2014. In September last year, police arrested nine men in London on suspicion of being members of Al-Muhajiroun and supporting terrorism. The suspects included Anjem Choudary, one of the most high-profile radical Muslim preachers in Britain and once the head of Al-Muhajiroun. In January, several Muslim protesters who belong to proscribed Al-Muhajiroun were issued with Asbos (Anti-Social Behavior Orders) prohibiting them from continuing their activities, such as being in a group where a megaphone is used, or where items are burned, or flags larger than 2 meters are displayed.